Cad is Féiniúlacht Fhoghlaimeora ann? B’é George Kelly (1955) a chéadmhol Síceolaíocht na dTógán Pearsanta. Bhí sé den tuairim gur eolaí gach duine againn agus go bhfuil sé ar ár gcumas ionadaíocht a dhéanamh ar ár dtimpeallacht seachas díreach freagairt di. Samhlaíodh do Kelly go raibh an duine gníomhach i gcosán a shaoil agus gur féidir tuiscintí reatha an duine ar an saol a athbhreithniú agus a athchur. Tá a theoiric an-úsáideach dóibhsean gur mian leo tuiscint a bheith acu ar smaointeoireacht mhúinteora agus fhoghlaimeora ón taobh istigh, ó ‘the world of the lived experience from the point of view of those who live it’ (Scwandf, 1994). Spreagann a chur chuige an turgnamhaí chun a fháil amach cad air atá an duine eile ag smaoineamh seachas go mbeadh an duine eile ag smaoineamh ar cad air atá an turgnamhaí ag smaoineamh. Tá na teicnící a úsáidtear neamhiata agus tá baint acu le cur chuige tógachais agus idirmhínithe. Úsáideann an tsraith MMF dréimiriú, scálú agus réimse leideanna neamhiata chun dearcadh an pháiste ar an saol a lorg. Is creat luachmhar é a chabhraíonn linn tuiscint a fháil ar an mbealach ina fheiceann páistí iad féin agus a ról sa saol seo. Tá próifíliú láidreachtaí bunaithe ar an tuairim go bhfuil láidreachtaí ag gach dalta agus an poitéinseal ag cách na láidreachtaí sin a úsáid chun aidhmeanna pearsanta a bhaint amach. Le deich mbliana anuas, tá breis aitheantais á thabhairt don luach a bhaineann le creat peirspictíochta láidreachtaí chun tuiscint a fháil ar fhoghlaimeoirí agus breis béime á chur ar láidreachtaí agus ar chumais. Tá peirspictíocht láidreachtaí lárnach i ngníomhaíochtaí na ndaltaí agus iad ag bogadh ar aghaidh tríd an bpróiseas múnlaitheach i bhforbairt a gcuid aitheantais mar fhoghlaimeoirí. Agus béim á chur ar láidreachtaí, aithníonn daltaí na cumais ar féidir leo a bhaint amach seachas a bheith ag cur béime ar bhuanna atá nó nach bhfuil acu. Pléitear ceithre láidreacht charachtair is fiche sa tsraith agus úsáidtear scéalta agus dánta i dTreoirlínte an Mhúinteora chun na láidreachtaí carachtair seo a fhorbairt. Tá Tógachas Sóisialta agus teagasc tógachaíoch bunaithe ar an bpriosabal go dtarlaíonn foghlaim nuair a bhíonn foghlaimeoirí gníomhach i bpróiseas tógála na brí agus an eolais, seachas a bheith ag glacadh eolais go héighníomhach. Is iad na foghlaimeoirí a chumann an bhrí agus an t-eolas. Sa tsraith MMF, bristear síos bacanna mar gheall ar dhifríochtaí foghlama. Is leat féin do leathanach breacaireachta agus baineann a luach leat féin amháin. Is acmhainn chuimsitheach é MMF le haghaidh gach foghlaimeora i ngach seomra ranga ina lorgaítear agus ina bpléitear dearcadh pearsanta gach duine. Tacaíonn cleachtais phiarmheasúnaithe agus leideanna ‘déan machnamh le chéile agus roinn’ le cur chuige tógachais shóisialta san fhoghlaim agus sa mhúinteoireacht. Tá rannán sa tsraith MMF bunaithe ar ‘Mo Shlite Foghlama’. Pléitear le meon an fhoghlaimeora agus le meon aigne fáis sa rannóg seo. Aithnítear leis seo go bhfuil claonta i dtreo patrúin áirithe iompair intleachtaigh agus go sealbhaítear meonta. Is é atá i gceist leis an rannán seo ná feasacht agus tuiscint an fhoghlaimeora a thógáil ar an mbrí a bhaineann le meon an fhoghlaimeora agus forbairt a dhéanamh ar na cumais, uirlisí agus teaicticí chun an meon sin a úsáid go héifeachtach a fhorbairt. Breis is 30 bliain ó shin, chuir Carol Dweck agus a comhghleacaithe spéis sa dearcadh a bhí ag daltaí mar gheall ar theip. Thug siad faoi deara go raibh daltaí áirithe ábalta glacadh le teip agus gur ghoill an teip go mór ar dhaltaí eile. Tar éis di staidéar a dhéanamh ar na mílte páiste eile, chum Dr Dweck na téarmaí ‘meon aigne seasta’ agus ‘meon aigne fáis’ chun cur síos a dhéanamh ar na tuairimí atá ag daoine maidir le foghlaim agus le hintleacht. Nuair a thuigeann daltaí gur féidir leo éirí níos cliste, tuigeann siad go gcabhraíonn iarracht leo éirí níos láidre. Mar sin, caitheann siad níos mó ama ar thascanna, déanann siad iarracht bhreise agus éiríonn níos fearr leo. Bunaithe ar an taighde a rinne Dweck in Ollscoil Stanford, pléitear le ‘meon aigne seasta’ agus ‘meon aigne fáis’ sa tsraith MMF agus spreagtar foghlaimeoirí chun meon fáis a úsáid ina gcur chuige don fhoghlaim. Glactar leis gurb é atá i gceist le héifeachtúlacht fhoghlaimeora ná an chreidiúint atá againn inár gcumais chun sprioc nó toradh a bhaint amach. Tá daltaí a bhfuil creidiúint láidir acu ina gcumais féin níos fearr chun iad féin a spreagadh agus tá seans níos fearr ann go dtógfaidh siad dúshláin maidir le tascanna deacra orthu féin. Déantar iarracht shonrach sa tsraith MMF éifeachtúlacht fhoghlama a chothú trí dhaltaí a chumasú chun foghlaim conas foghlaim trí mheon foghlama agus meon aigne a fhorbairt agus trí éisteacht lena nguthanna, lena dtuairimí agus lena bpeirspicíocht. Tarlaíonn foghlaim nuair a bhíonn smacht ag an bhfoghlaimeoir ar an bpróiseas foghlama. Méadaítear éifeachtúlacht san fhoghlaim nuair a theastaíonn ó fhoghlaimeoirí a bheith ag foghlaim, nuair a dhéanann siad machnamh, nuair a chuireann siad an bhrí ar fáil agus nuair a úsáideann siad an fhoghlaim ar mhaithe leo féin (Farrington et al. 2012). 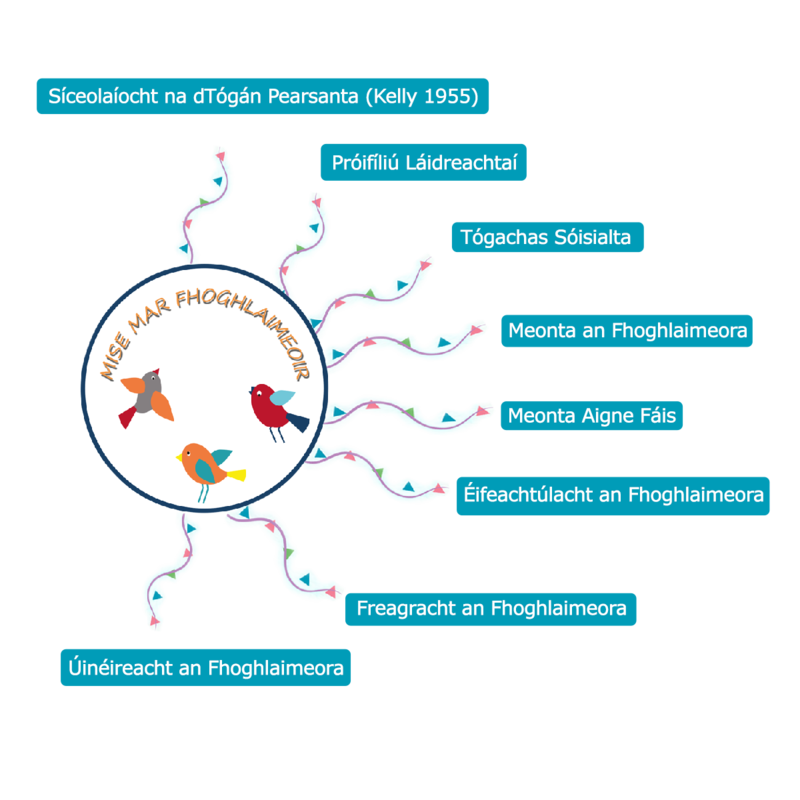 Deirtear go mbíonn tionchar ag an bhfreagracht a ghlacann an foghlaimeoir air féin dá chuid foghlama ar a fhéiniúlacht mar fhoghlaimeoir neamhspleách fadsaolach (Kolb & Kolb, 2012). Cothaíonn an tSraith ‘Mise Mar Fhoghlaimeoir’ úinéireacht, éifeachtúlacht agus freagracht trí féinmhachnamh agus féinmheasúnú a mholadh agus trí machnamh a dhéanamh ar straitéisí chun an fhoghlaim a fheabhsú. Déantar an fhoghlaim a fheabhsú trí tionchar straitéisí roghnaithe ar éifeacht na foghlama a mheas.